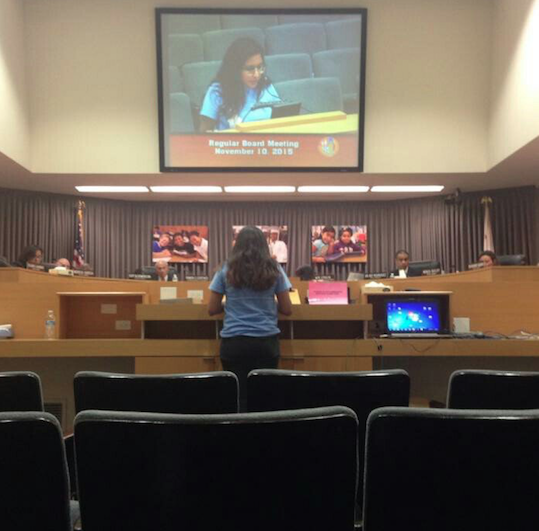 Christelle Rocha waited nine hours to speak to the board. A group of college students told the LA Unified board this week that its effort to reach non-Internet-connected people as part of the superintendent search was inadequate. “We walked through neighborhoods and found more than 200 community members who lacked Internet access and didn’t have a means of travel to the community meetings, but care about education and weren’t able to provide their input,” said Christelle Rocha, the chapter leader of the Students for Education Reform. 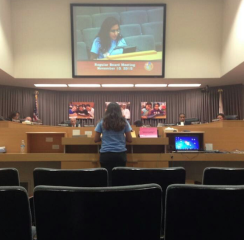 Rocha said it was well worth the nine hours wait at the LAUSD school board’s long meeting on Tuesday to present her findings. “These people did not have a car, and they didn’t know about the superintendent search, but they want to have a say,” said Rocha, who attends UCLA. The disenfranchised people that the students identified are predominantly Latino and do not speak English. The volunteer student team found parents who didn’t know there was a search underway in the district. The student report echoes the concerns that community groups have about not reaching some sectors of the community. Several groups have held their own forums. It also reflects some of the concerns raised by school board members Steve Zimmer and Mónica Ratliff, that the community input needs to be as inclusive as possible. Zimmer took the student group’s findings and made sure the information went to the entire board, which will interview candidates for the position in the weeks ahead. “We commend Mr. Zimmer for encouraging more community engagement, but we have proven that the search did not reach some people in the community,” Rocha said. Hank Gmitro, leader of the firm hired to conduct the search, said the search team tried to reach every corner of the large school district during more than two weeks of community forums and survey distributions. The surveys were printed in five languages and distributed at all schools and many community centers. Students for Education Reform is a non-profit college group that works to encourage involvement in the K-12 education system. The members involved in the survey include students from UCLA, East Los Angeles College, California State University Dominguez Hills, Whittier College and University of California Riverside. The students created their own written survey and helped people fill them out. “We believe that the survey currently in place, online, has not outreached to the highly dense Latino and Spanish speaking population they serve,” said Ramirez, who pointed out that more than 70 percent of LA Unified’s students are Latino. The students presented the raw data to the school board members but didn’t compile a composite profile as the search firm did. Of course, the students didn’t get paid $160,000 to do surveys, either, as the search firm did.